Hidden object games are a staple of casual games, but their popularity has never quite transferred over to the iPhone. A big part of that is definitely the smaller screen and fussy touch sensitivity. Speaking for myself, I love hidden object games, but I absolutely -hate- having to squint at a tiny, darkened image and worry that the game is going to punish my stubby finger’s attempt at precision tapping. Thankfully, Super Search 60 totally gets these concerns and creates a hidden object game that is gorgeously iPhone/iPod Touch compatible. A hidden object game is pretty much exactly what it sounds like; there are a bunch of objects hidden, and you want to find them. Where’s Waldo may be the most popular example out there, but Super Search 60 does a much better job of bringing the genre to the iPhone. Instead of bespectacled characters and a thin excuse for a story, you just get a big grid full of bright and clean illustrations and 60 seconds to find as many things as you can. A prompt on top tells you what you’re looking for, and when you tap the appropriate object, it disappears, and the column slides down to fill the hole. The prompt changes, and more objects dropping from the top. Sometimes you’ll be looking for sets of objects, like 3 balloons, and they might all be in different places and in different colors. It’s very simple, but also incredibly addicting. Each game is only a minute long, but it’s impossible to play only once. There’s an option to compare scores on Facebook, and even a weekly tournament to battle it out with other speedy finders. The graphics are very polished and the overall interface is nicely sleek and sensitive. Professional looking and a joy to handle, it’s easily the kind of game you can revisit again and again. Bottom line, Super Search 60 is simply addicting. 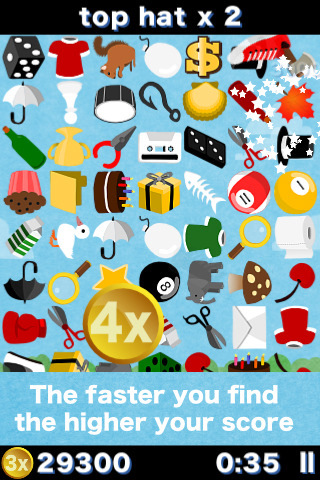 AppSafari review of Super Search 60 was written by Tracy Yonemoto on March 30th, 2010 and categorized under App Store, Free, Fun, Games, Time Management. Page viewed 5329 times, 1 so far today. Need help on using these apps? Please read the Help Page.